Heat oven to 350°F. Spray bottom and sides of 13x9-inch pan with cooking spray. In large bowl, stir cookie base ingredients until soft dough forms. Press dough in bottom of pan. Bake 10 minutes or just until dough is set. Meanwhile, in 1-quart saucepan, melt butter over medium heat. Stir in brown sugar. Heat to boiling, stirring frequently. Boil 1 minute, stirring constantly. Sprinkle potato chips and peanuts over partially baked base. Pour brown sugar mixture over chips and peanuts. Bake 15 minutes longer or until surface is bubbly. 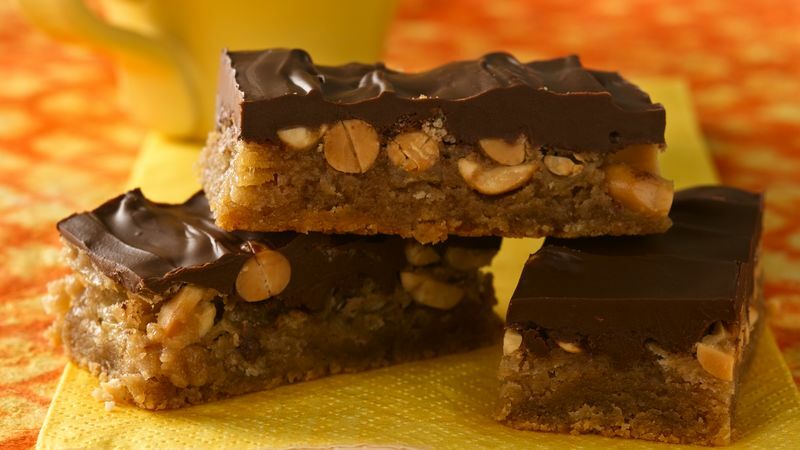 Sprinkle chocolate chips evenly over chips and peanuts; return to oven for 2 minutes to soften chocolate. Spread chocolate over filling. Cool completely, about 2 hours. Refrigerate 30 minutes or until chocolate is set. For bars, cut into 8 rows by 4 rows. Store covered at room temperature. This recipe was one of fifteen winners in the 2007 Mix It Up with Betty! Cookie Mix Recipe Contest. More than $10,000 was awarded! Refrigerating the bars for 30 minutes sets the chocolate so cutting and serving are a snap. Line the pan with foil, leaving the edge of the foil above the rim of the pan on two opposite sides. Lightly grease foil in pan. Bake bars as directed. When cool, use foil "handles" to remove the bars from the pan. Cutting and cleanup are now a snap.